What do chestnuts, brown butter, truffles, and Tobias Funke have in common? Anyway, the truffle’s been all sorts of fun. 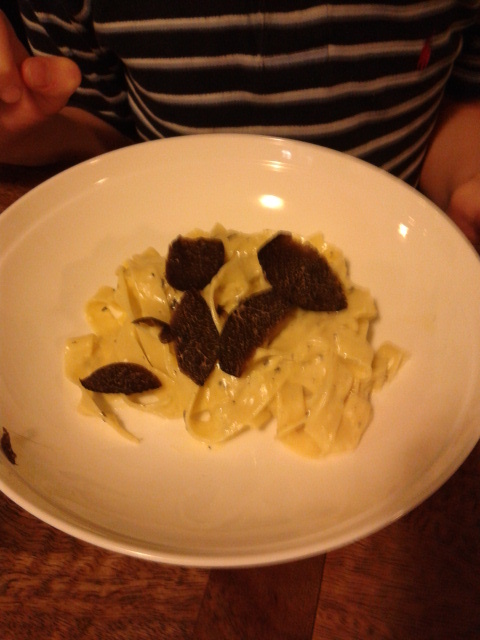 We did a creamy truffle pasta the other night (the Little Pricks loved it, as expected, in ascending proportion to their age) and there’s still a risotto and some scrambled eggs on the program. 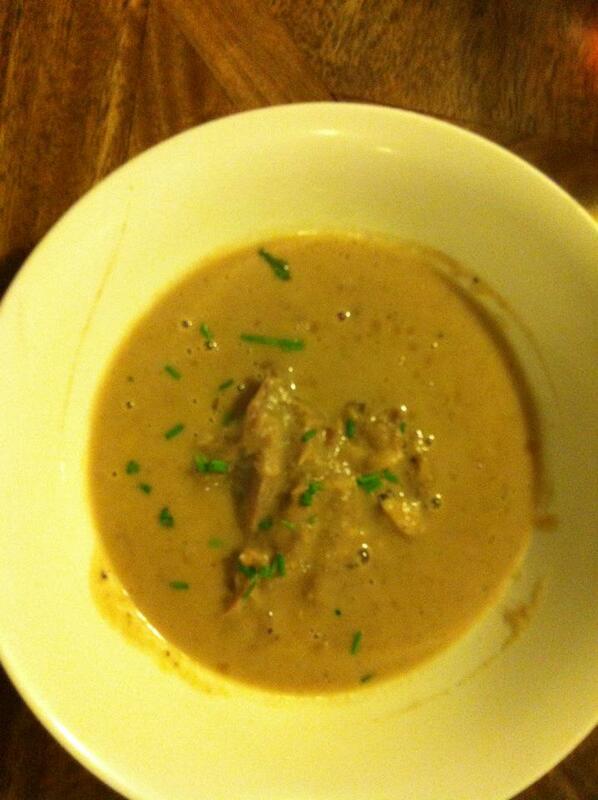 Last night I made up some chestnut soup, an old favourite around here that’s gone through a number of iterations over the years, with the intent of shaving a bit more black gold over the top, and let me tell you friends, if I may be an immodest Prick, I nailed it. The secret? Start with a proper beurre noisette, or brown butter. It takes no time at all, but is one of those amazing bits of alchemy that makes cooking a joy and should be in every chef’s arsenal. The reason why it works so well here is that as the solids in the butter brown (hence “noisette”), the butter begins to smell like nuts and hits you in the face like a Tobias Funke straight line. After that: Bacon, a rasher or two of the good, smoked stuff, chopped roughly into lardons (in Australia, the stuff from Schulz in South Australia is fantastic). Once that’s started to brown, add a shallot – this kind, not the green kind, thinly sliced – and some thyme. Then: take one of those wonderful save-you-the-agony-of-peeling-the-bastards 200g packs of vacuum-sealed chestnuts, chop it up, and sauté. Finally, add some madeira, cook down to a syrup, then pour in about 750ml of good beef stock. Let this go for about half an hour on a simmer. What’s left is simplicity itself. Strain the soup, reserving the liquid, and chuck the solids plus about half the liquid into the blender, and blitz like hell. Continue to add liquid until it’s the consistency you want; here, the Pricks prefer it to remain reasonably thick and velvety. Return to a clean pot, and when you’re ready to serve (this is a great make-head dinner party dish) heat through, add some butter and perhaps cream, and froth up with a hand blender. This makes two really huge bowls, but it’s infinitely scalable. Serve a little demi-tasse as an amuse, a full bowl with a crusty bread for a simple supper, or if you have some duck confit, shred the meat, warm it through, and place a heap in the middle of the bowl for a helluva cold-weather soup course. And if you’ve got them, don’t forget the truffles. This entry was posted in Recipes, Reviews, Uncategorized and tagged Chestnuts, Recipes. Bookmark the permalink. 2 Responses to What do chestnuts, brown butter, truffles, and Tobias Funke have in common? So glad you enjoyed the truffle, Mr Prick, and it certainly looks like you made a great job of it. That chestnut soup sounds delicious, and I like the idea of starting with beurre noisette, which would have been a solid foundation on which to build layers of flavour in the way you describe. I agree that in these kinds of dishes it is important to cook the wine down to a syrup, thereby concentrating the intensity of flavours through light caramelisatoin of the sugars therein. I can only imagine that the truffle was was wonderful compliment to an already very fine dish. Damn, hate it when you see a typo just when you press the post button!